We continue with our topic of interaction between the viewer, technology and the artist. It is no longer sufficient to admire a beautiful photograph, object, or painting… now we want to live an experience, to understand the process and see it come to life. New platforms and technologies are needed for this demand. Technology which allows the artists to perform and develop their new concepts and ideas, and platforms to support their creations. At the InterActive Corps (IAC) building in New York there is an interactive 36 meters by 3,35 m wall that unveils “Inkscapes.” A work of art and live art performance by Adriá Navarro and DI Shin. The artists work live on the moving wall with their iPads creating new material through the day. The narrative of the art work is a dialogue between the performers and the giant screen, which shows evolving art and figures. The graffiti and multimedia duo Sweatshoppe (Bruno Levy and Blake Shaw), in an effort to promote new platforms for public art and performance, impress us with a new technique that uses LEDs “paint rolls” which they have named “Video Painting.” The rolls are tracked by a camera, and the LEDs trace the line to be followed by a projector connected to a computer which sends visuals and colors according to the trace of the paint roll. 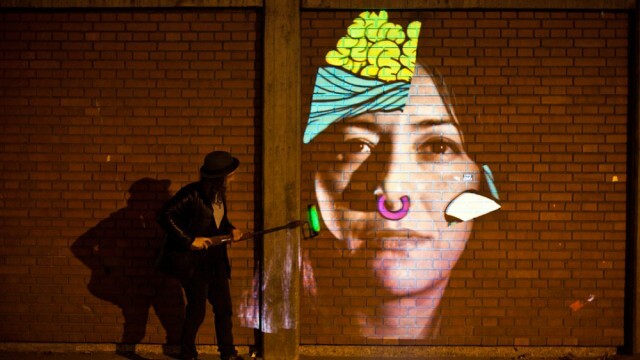 In this manner they create graffiti which is alive at night and can be exposed on any surface. Their work explores the relationship between video, music and technology. This entry was posted on April 9, 2013 by mcquant in Cases and tagged inkscapes, interactive art, Interactive corps, LED, sweatshoppe, Technology.